Traditional Japanese bar with reasonably priced Japanese food. Service could be improved for a better food experience. 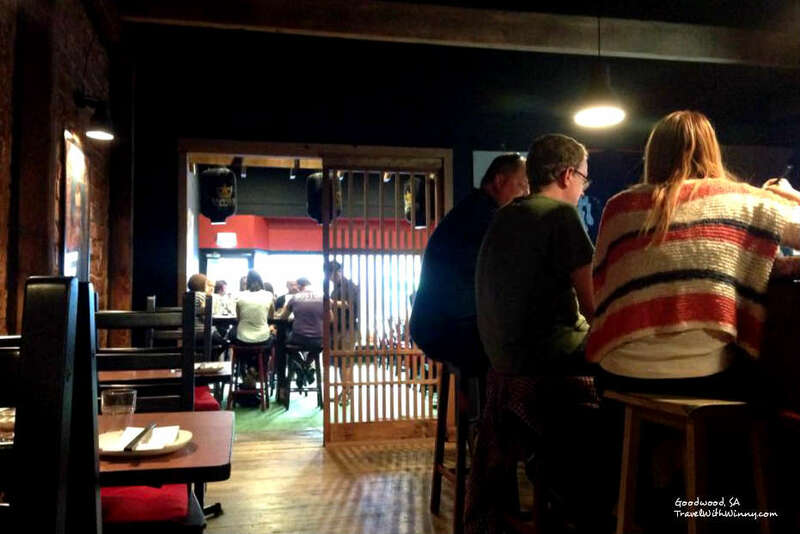 En Japanese Bar in Goodwood is quite a unique one for Adelaide. The restaurant is set out like a traditional Japanese bar, the decorations were mainly wooden and area was slightly dim. The wooden floors shake and creek a little when people walk pass our table. There were many selections of Japanese alcohol available and on display behind the bar. The majority of the servers and chefs were Japanese and speaking in Japanese and this sets the mood as a traditional bar well. There is an area at the front of the restaurant that gives the illusion to be an outdoor bar area but still have the comfort of being indoors. The restaurant was quite busy when we entered the place with the servers racing around to serve food and prepare alcohol. They hardly recognised that we have entered so we placed ourselves on a table behind the bar. Soon one of the waiter whizzed around to give us our menu before continuing to do his chores. There weren’t that many people in the shop and there were quite a few waiters around but they really appeared to be understaffed because the service wasn’t really the best with all this running around. We decided to try three tapas and one plate of assorted sushi. First up was the dish called Cha-Shu. 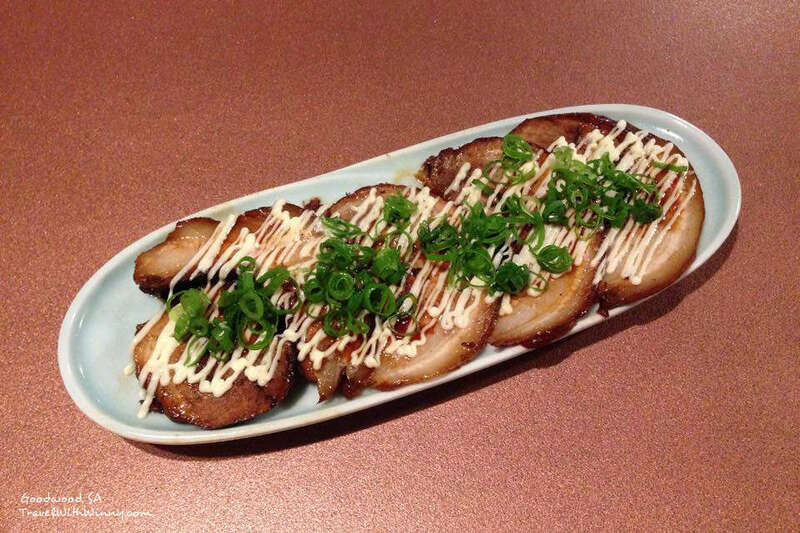 It was a stewed, flamed, grilled rolled pork belly with mayonnaise and spring onion. The meat itself was flavoured well but the pork belly section was a little oily with all the fat. The mayonnaise was a little overkill with the oiliness. Still the dish was quite nice and would go down well with a shot of sake. Our next dish was the pork Negima. 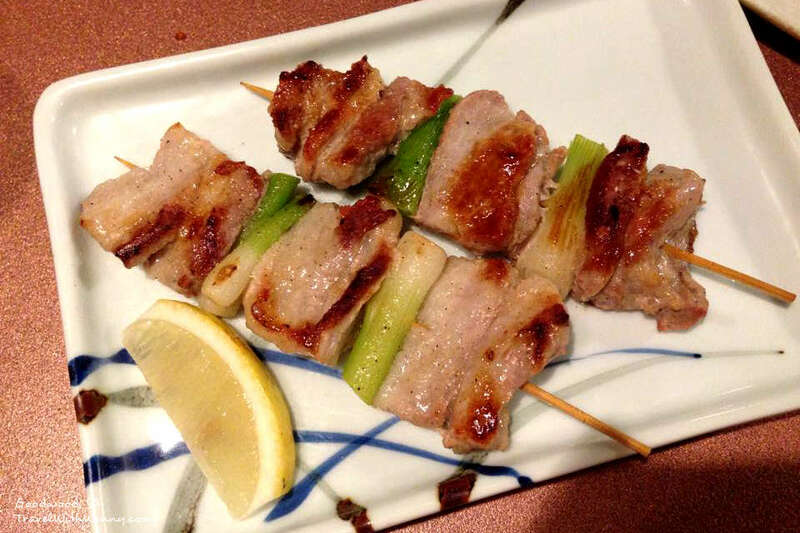 This is yakitori style pork and spring onion skewers. They were quite plain without too much flavouring which is what we prefer. They were not too oily and the pork taste mixed well with the lemon that came with the dish. The last of our tapas was Kara-age which was deep fried chicken marinated in soy and sake. This dish was quite alright. It was crunchy and oily as expected because it is a deep fried chicken. 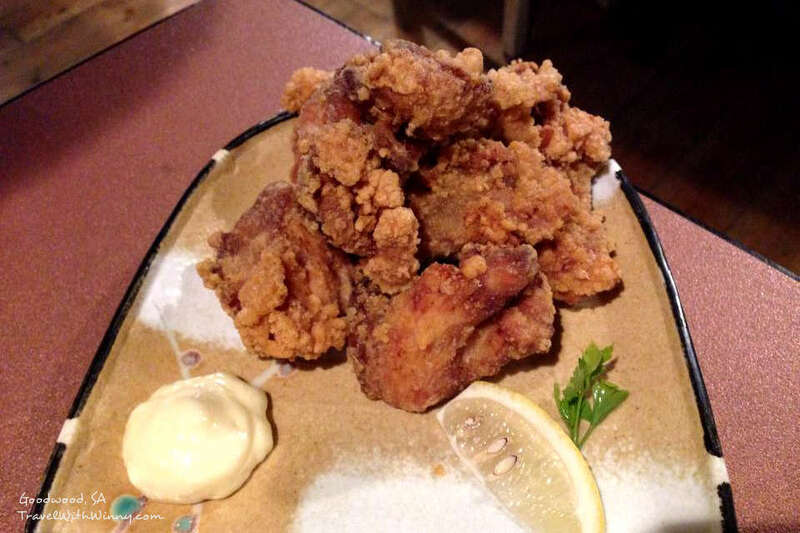 The chicken is in small bits and has the unique kara-age taste which has a hint of sake smell. I have had tasted better ones in Adelaide before so I wouldn’t say this one was that tasty. Our assorted Nigiri Sushi set took the longest to come. 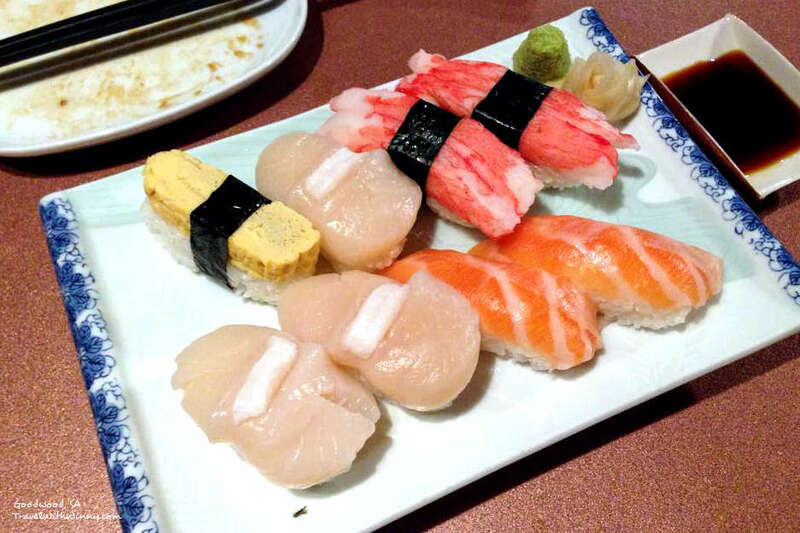 (Nigiri is the sushi where the fish/other ingredients are placed on a roll of rice) This set supposedly should have Salmon, kingfish, scallop, egg, prawn and crabstick Nigiri. We were told that the Kingfish had all been used up and wanted to replace it with salmon. 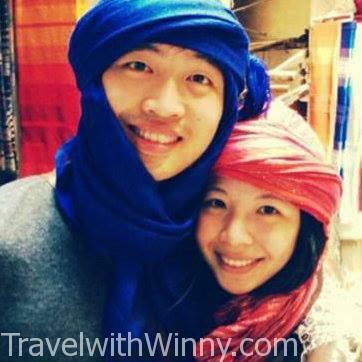 As Winny was not a big fan of salmon, we requested to change it to scallop which they requested to be $2 extra. We were happy with the change however we later found out that in the set (evidently from our photo) that there were no prawns either and they have switched it to crab sticks. Winny isn’t impressed because we only found out when we were going through the menu at home for this blog . The rice served with the Nigiri was a little too warm. Good Nigiri rice should be around room temperature. They either used warm rice or the chef held onto them for too long. The ingredients did taste fresh though and the price was quite reasonable. Overall it wasn’t a very expensive dinner and most of the food was nice besides being deceived for one less piece of prawn. The service also definitely needed improvement. If you could look past that, it isn’t a bad place for a traditional Japanese bar meal with some sake and enjoy the traditional bar environment.